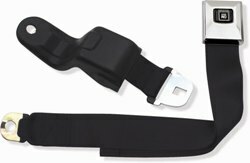 These are replacement Seat Belts for 1968-1969 Camaro Firebird Deluxe Interior Bucket Seat Belts. OER reproductions features correct retractor, seat belt, & buckle assembly with GM emblem. Available per seat/set for Front or Rear. Also available in a Complete Kit with 2 Front & 3 Rear.